The 5th grade classes at Tipton Elementary annually complete a walking tour in our town and visit the Waterworks, County Jail, Fire Department, Library, and Pizza King! We were all looking forward to our turn for the day trip. The Water Works was cool (groundwater is 54 degrees!). First, we found out that water is pumped into a large 500,000-gallon storage tank on the north side of the Water Works building. Then chlorine is added to kill any germs or bacteria that may be present; so it is safe to drink, bathe in, cook with, and use as needed. You also use chlorine in swimming pools to fight germs. When people get in a pool, they’re really sweaty and then germs get into the pool. Following the addition of the chlorine, the water is pumped into the filter tanks so the impurities can settle out. The tanks are regularly flushed out, the water coming out was disgusting! It looked like iced tea! They backwashed ¼ of one tank while we observed. Following this, the water is pumped out of the tank in the water tower, then to the city. There are two large water towers in Tipton. One is on the north side of town by Co-op and is silver. The newer spherical one by the IU Hospital was just repainted a beautiful shade of sky blue. The second place where we went was Pizza King. All the classes went to Pizza King on the courthouse square for lunch. There we made our own personal pan pizza! You could choose between sausage, pepperoni, and cheese to put on your pizza. Your plate had a number from 1-20 or more depending on how many students were in the classes. Then the Pizza King people put it in the oven for about 10 minutes to bake to perfection! When it is out of the oven, they brought it to so you could eat it for lunch. You got one refill of Sprite, then you get refills of water only. When you were done, you can chat with your friends. Third, we went to the library. At the library we went into the different themed/age/interest rooms. Then we looked at the different areas like the children’s and adults’ section of the library. Computers are available to the public for those citizens who do not have one at home for whatever the reason. That’s really great! These are available to students and adults. There are many options and activities that were new to us. Then we made charcoal drawings of whatever they wanted or be creative. The library has books and activities for people ranging from pre-school to adult. I’ll be looking forward to next summer’s reading program…. I wonder what the theme will be this year? The fourth stop on our trip was the jail. We learned that they wear white and black colored shirts and pants or shorts. One person had to wear orange, if they were the cooking or making food person. If one person wanted to kill himself, or hurt another prisoner, then they would have to go in “the wrap. “This protected themselves and others from injury. When they first got to the jail, they got shoes (sandals) so that way they wouldn’t go walking barefoot. They also got a toothbrush, shampoo, conditioner, a pair of pants or shorts, and shirt. However, these were the white and black ones. They have a basketball court in a small recreation area so they can play when it is their free or their exercise time. If they tried to escape, they will get cut by the barbed wire around the top of the fenced recreation area. Depending upon the situation, they may be tasered. The fifth stop on our field trip was the fire barn. The firemen talked about the ladder trucks and how much water it can hold. They showed us around the building. They showed us their bedroom, living area, and the kitchen. They also talked about the history of the fire barn and passed crew members. Everyone was asked if they have a smoke detector at their home...a very important thing. A family in Logansport lost 2 children this week in a house fire. It was stated on Fox 59 that they did not have a smoke detector! Two children’s lives could have been saved! 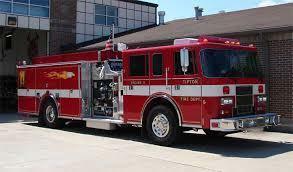 The trucks Tipton Fire Department utilize have a thermal infrared camera so to assist them in finding victims in smoke or flame filled room. This concluded the “Our Town” field trip my my class. All the fifth grade classrooms participated in the trips. We alternated days to avoid too many visitors at one stop at a time. Thanks to all for everything you do to serve our community! We were able to learn many new facts about “Our Town”!